"Latkes and goody things all over town, it’s Honeyky Hanukah time!" In Woody Guthrie’s rowdy, funny celebration of Hanukah, a young boy and his dog move merrily from house to house, gathering up family and friends for a big feast. 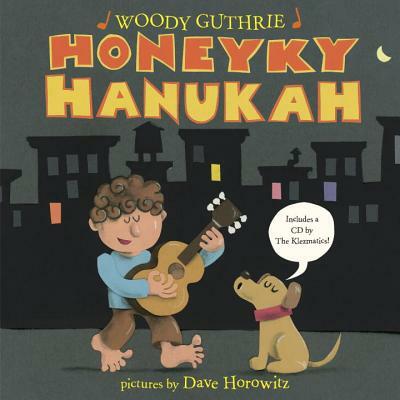 With an accompanying CD, featuring Guthrie’s song recorded by the Klezmatics, this is a Hanukah book you can dance to! Woody Guthrie (1912-1967) was a legendary American folk singer-songwriter. His songs told the stories of the American people: their land, their labors, their trials and their joys. While many of his songs were born of his experience in the Dust Bowl during the Great Depression, "Honeyky Hanukah" was part of a little-known series of songs he wrote celebrating Jewish culture, inspired by his mother in law, Aliza Greenblatt, a well-known Yiddish poet who lived across the street from him during his years in Coney Island, New York. Dave Horowitz has written and illustrated over a dozen popular books for children, including The Ugly Pumpkin, Humpty Dumpty Climbs Again, Twenty-Six Princesses (and its counterpart, Twenty-Six Pirates), as well as the 2008 Sydney Taylor Notable Book Five Little Gefiltes. Dave lives in New York's Hudson Valley. Besides making books for kids, Dave has been a drummer, a rock climbing guide, and a college professor. His favorite color is orange.